Sage and rosewater ice cream. In the age-old question vanilla vs. chocolate, chocolate is the older ice cream, but vanilla has been the most popular ice cream of the last 200 years. Ice cream as we know it descended from the European tradition of dessert custards made with eggs. The base for a “custard style” ice cream, or one with egg yolks in it, is the same as that for a baked custard. So after the freezing process was discovered, it was a natural progression to frozen creams. Some of the more interesting flavors from Medieval Europe include: saffron, honey & citron, sage & rose-water, laurel leaves, tarragon, celery, and crumbled cookies. Vanilla was very hard to acquire before the mid-19th century. It was only produced in Mexico, because of the vanilla orchid’s symbiotic relationship with the local bee–the bee pollinated the flowers. Instead of vanilla, early ice creams were flavored with orange flower water or rosewater, ingredients commonly used in all sorts of desserts. The first known written recipe for ice cream is from 1665, handwritten in the recipe book of Lady Anne Fanshawe. Notice she flavors her “icy cream” with mace, orange flower water, or ambergris (a ball of smelly brown stuff that whales puke up (ew)). There’s a great article by culinary historian Ivan Day, who made ice cream from this recipe, here. The first known ice cream recipe. 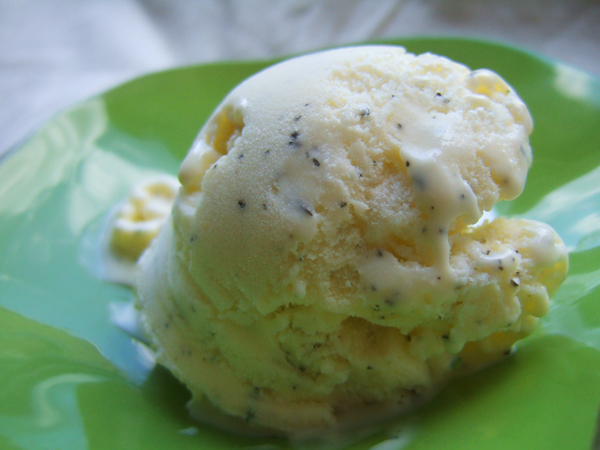 Vanilla doesn’t appear in ice cream recipes until the 1760s, and then it would have been used very rarely. 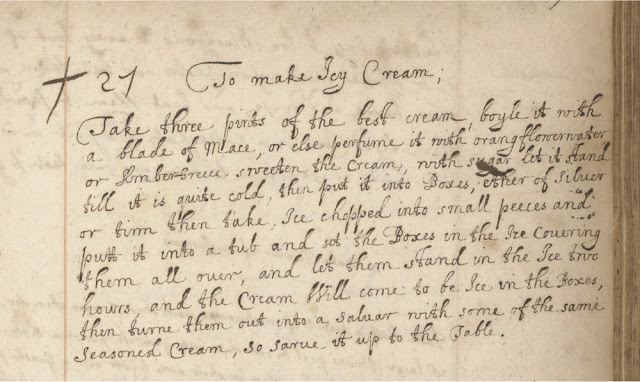 But Vanilla had been a favorite ice cream flavor even before the spice was readily available: there are about a dozen recipes in Thomas Jefferson’s papers, and one of them is for vanilla ice cream (see it here). The earliest ice cream recipes published in American, in The Virginia Housewife in 1824, includes vanilla as well as almond, coconut, citron, and fresh fruit flavors (see it here, buy it here). By the early 19th century, it was described as one of the most common ice cream flavors–despite the fact that the spice itself was still fairly uncommon. I made an ice cream inspired by medieval custards from the pre-vanilla days: sage and rosewater. I used a basic ice cream recipe and added one teaspoon of rosewater, and steeped a small handful of fresh sage leaves in heated milk. I added one teaspoon of crumbled, dried sage leaves as the ice cream was freezing in the ice cream maker. I wasn’t crazy about this ice cream, but I wouldn’t call it bad. Many of the people who tasted it enjoyed it. The flavors are extremely subtle: if you didn’t know what you were eating, it would be nearly impossible to identify the taste. It’s vaguely like soap, but pleasant, if that’s possible. Next: Ice cream of the future! I’ve read that post before and it made me curious! I wonder where you even get your hands on ambergris nowadays. But still–whale puke. 17 Things You Might Not Know About Ice Cream | The Usual Sources – Where You Are The Source.